The Yangguan (Yang Pass), together with another grand pass - Yumen Pass, acted as important passageways to Central Asia, India and Europe. Emperor Wudi of the Western Han Dynasty (206BC - 24AD) built Yangguan Pass and Yumenguan Pass in 121BC in order to resist the Huns (Xiongnu) and manage the West Region covering the areas west of the Yellow River in Gansu and four prefectures of Wuwei, Zhangye, Jiuquan, and Dunhuang. 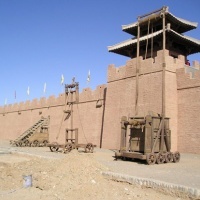 Yangguan Pass once was the gateway to the Xiyu area and an important pass on the Silk Road. Buddhist monk Xuan Zang set foot there on his return to Chang'An (Xian) from India. During that period, Yangguan Pass, as a military stronghold, was rich in water and was an oasis. Today Yangguan, is in ruins buried under sand dunes. 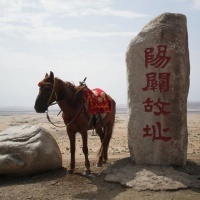 About 70 kilometers southwest of the city of Dunhuang, in the town of Nanxiang, the site of Yangguan (Yang Pass) is situated. what is left is a ruined tower standing on a reddish sandstone hill. It gives a perfect view of the vast area around it. Traces of the wall foundation of Yangguan Pass can be seen at times amidst the dunes. To the south of this tower is an expanse of land which is strewn with broken tiles, an evidence of a civilization. It is known as Gudongtan, Beach of Curios. It is a desert full of precious deposits. It is said that the trousseau of a princess of the Tang dynasty was buried here by a sudden sandstorm. 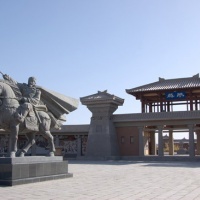 On visiting Yangguan Pass one may be dismayed to find the loss of a civilization there but the museum of the Yangguan Pass offers a glimpse of the grandeur of the past. 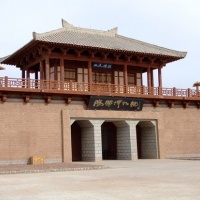 A decorated archway of the Han Dynasty, the exhibition hall of the Silk Road, the Yangguan Pass stone carvings reestablish the grandeur of the Han Dynasty. The Yang Pass related itself to the main ancient accesses to West Region and an important conjunction on the south route of the Silk Road. What is more important, it stand on a world wonder - The Great Wall of China.